How Many Seed Potatoes to Buy? When calculating how many Seed Potatoes to buy, gardeners have to know what space is available in the vegetable garden for growing the potatoes. 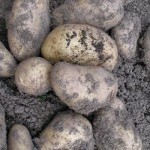 Potatoes are grown from ‘seed’ potatoes, which are small, immature potatoes or tubers. Seed potatoes are sold ‘loose’ in old fashioned hardware shops and garden centers, but it is more common to find them in small, sealed packets. 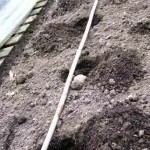 To work out how many potatoes to buy, decide where the potatoes will be planted and measure the length of the rows available. So if the row is 6ft long, you will need 6 potatoes (remember that if there are only 5 seed potatoes in the packet you can divide the largest potato into 2). If possible, rows should run from North to South so each plant gets it’s full share of sun. early potatoes are expensive to buy. 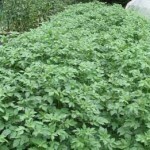 It is easy to calculate how many seed potatoes to buy when you consider what space is available in the vegetable garden for growing the potatoes. Remember that unblemished, clean, certified seed potatoes are worth the investment!